Wow! It looks fantastic. Great work. 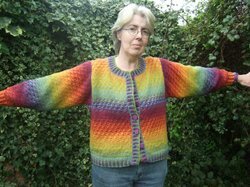 I also found your site through an oddball knitting search. 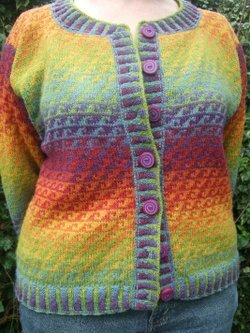 Your cardigan is beautiful.... far surpasses the tatty afghan rug that was once my stash! How pretty! 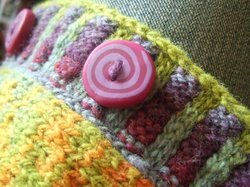 I love the colors, and the buttons are cute! It's gorgeous! Did you make the buttons yourself? 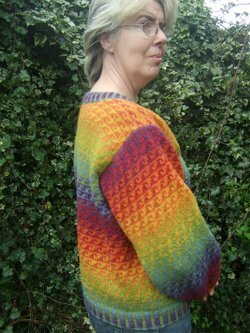 I found your site through a random search for "oddball knitting" (must have been an advertiser's link). Before I resume my search, I had to tell you that my jaw dropped at your handiwork. 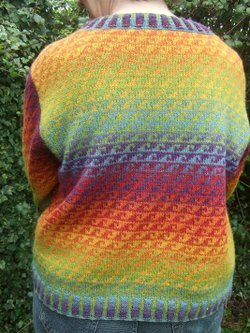 This is hand-made knitting at its pinnacle, in my opinion- intricate, lush, crisp, and gorgeous. One look and we know it was hand-made, but in a good way. I've made a couple sweaters and a cardigan, but I don't think I'll ever make it to where you have. Brava! Beautiful sweater. I love it. Love it!!!!!!! I have a hankering - get it!! HANKering!!! WOW!!! Is all I can say that looks stunning!!! BTW are you aware that there is a nasty pop up when one comes to your site? My Popup Checker warned me.. It's lovely! The buttons are a perfect match.